29/09/2012 A Little Saturday Football Entertainment. 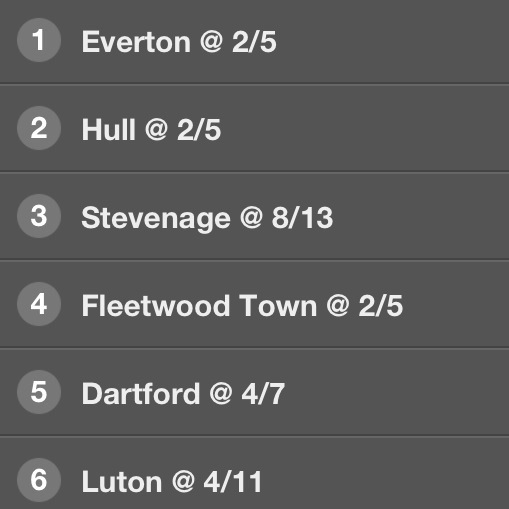 Having had a little look at today’s football I have picked a little six timer accumulator. It pays out at nearly 8/1 on the best odds and is a good one for a little Saturday afternoon entertainment. Don’t go made on it though. Just a little flutter for watching Jeff and the rest of the boys on Sky Sports from 3pm! 26/09/2012 : Winner Winner Chicken Dinner.